We have collected and analysed 11 expert reviews and 99 user reviews from international sources. Experts rate this product 72/100 and users rate it 88/100. The average review date is 06-09-2015. We have compared these reviews to 367686 reviews from other Camcorders. The alaScore™ for this product is 90/100 = Excellent. 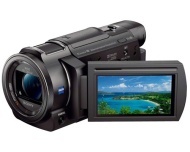 Last update: 18-04-2019.
alaTest has collected and analyzed 14 user reviews of Sony FDR-AXP33 from Amazon.co.uk. The average user rating for this product is 4.9/5, compared to an average user rating of 4.0/5 for other Camcorders on Amazon.co.uk. Comments about the reliability and size are on the whole positive. The image quality and portability also get good reviews, but some have doubts about the memory and price.